Our Blessed Mother is tough to honor in a few paragraphs. In fact, she is tough to honor our entire lives because of the great gift she has given us; her Son! How can we ever come close to honoring that gift?! Nonetheless, we must do our best to honor her in all things. Among her many virtues, one of them was that she was poor. Thinking back to the way of life in those days, life was not as “easy” in terms of convenience as it is today. There were no cars, no grocery stores on the corner, and there was certainly no technology. Many people were not well off and struggled to have daily necessities met, like many people in our society still today. However, while Mary may have been poor financially, she was certainly not lacking in faith, and that made her very rich in the most important way. I have never really been enthralled by the “excess” of life. Of course people need food, medical care, shelter, and some clothes to live, but the gargantuan amounts of stuff people acquire stopped appealing to me long ago when I became a minimalist. Basically, I don’t like to live with a lot of stuff and, by choice, most of my items fit in two small boxes. The deep desire of that lifestyle has been rooted in me through Christ. As Jesus said in Matthew 19:21 "If you wish to be complete, go and sell your possessions and give to the poor, and you will have treasure in heaven; and come, follow Me." There are many references in the bible to having less and focusing on God. One of the pioneers in that was Our Blessed Mother herself. While she may not have wanted to have Jesus in a manger, it was God’s will and she was obedient (Luke 2:7 And she gave birth to her firstborn son; and she wrapped Him in cloths, and laid Him in a manger, because there was no room for them in the inn). So I asked myself this question: if the Queen of Heaven and Earth can be content with not having much in life and Jesus tells us to focus on Him, whom I am to own so many things? It didn’t feel right, so out it all went to others who needed it more! Our Savior, the King of Kings, was born in a manger because no one was willing to give up their bed for a night. Yet, we as a society have an abundance of “stuff”. Something is not right with that picture, we are not using our resources how God intended. There is something humbling and peaceful about having just enough to meet your needs. Mother Mary didn’t have excess, yet she is the most blessed woman by God. Mother Mary was poor financially, yet rich spiritually. Her focus was on doing God’s will, and not being distracted by earthly riches, which will all pass away. I believe that God gives us such earthly abundance at times to challenge us to show Him what is most important to us during whatever phase of life we are in. It’s as if He says; “choose me or choose the new outfit”. Sisters, don’t let your life get too distracted by earthly goods. This life is a pilgrimage and Mother Mary is here to help you along the way. Look to her for the perfect example of faith, and not having an abundance of earthly riches, yet being more blessed than we can ever imagine. Act: I challenge you, not only this holiday season, but all year round, to declutter your life to make room for what is most important: Christ! Fill up bags and donate to those in need. Someone can ALWAYS use what you don’t need. I challenge you to go one step further, since it is Advent as well, and donate something you love. 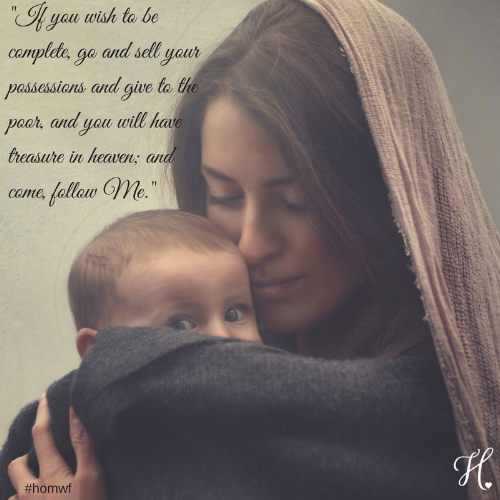 Imagine Mother Mary asking you gently to show her the most important thing you can have is Christ’s love, not an item, and then imagine someone receiving that item and what joy it will bring to them this holiday season and all year round (take a picture if it’s very hard for you to give up).